The Shopping Center Group, a commercial real estate company with offices in 12 states, offers a wide range of advisory services—including property management, construction supervision, and tenant representation—to retail tenants, landlords, and developers. But the Shopping Center Group does more than ink sales and lease deals. The company provides clients with in-depth analyses of trade areas to “better understand the consumer, trends, market drivers and the competitive retail landscape,” as it says on its website. Information drives its operations. And GIS powers that information, as well as its analyses. Using two GPS datasets, the Shopping Center Group highlighted the differences between the home locations of people who frequent Colonie Center in Albany, New York, and the work locations of those who patronize the same shopping center. The company can then use Esri Business Analyst Online to uncover slight variations in the demographics and psychographics of Colonie Center guests. The Shopping Center Group operates 22 offices mostly on the East Coast—from New York to Florida and Mississippi to Kentucky—and it recently opened an office in Santa Barbara, California, with the intent of growing its West Coast operations. As a retail-only real estate platform, the company has four primary service lines: working with tenants to find locations and optimize markets; leasing space for landlords; managing retail properties; and selling investment-grade retail premises, such as large grocery store-anchored centers or shopping centers. Conducting the extensive analysis required to evaluate a trade area (the geographic region from which a shopping center gets most of its customers) calls for maps, which the Shopping Center Group has always relied on. In each state the company covers, it has every retail trade area mapped out. And because the Shopping Center Group believes in having boots on the ground to gain local market knowledge, it spreads its GIS across the organization. 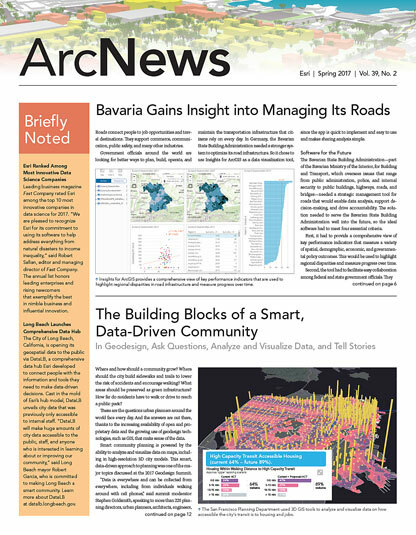 “People in each office use ArcGIS Desktop, Esri Business Analyst, and ArcGIS Online,” said Katz. Out of the Shopping Center Group’s 215 team members, 28 are mappers. The Shopping Center Group uses ArcGIS Online, mainly, to share information internally and with its clients. The company has also created apps that provide team members with market intelligence—such as what’s happening in a specific trade area or information on other retailers—that they can share with clients. Being able to show this to customers has certainly influenced their business decisions. Making this data easily available to clients is one of the reasons the Shopping Center Group is beginning to use Esri Story Maps apps as well. For one project, the company built a story map to show a developer all the current, planned, and under-construction developments in a certain district to give the builder a firm understanding of what was happening in the trade area. The Shopping Center Group updates the story map as needed as well, to allow the current landscape to be better understood. The Shopping Center Group is currently looking into analyzing and visualizing psychographic data, too. The company is also starting to focus more on GPS data to show the movement of people. It wants to understand where people live, where they go to work, and how they move throughout the day so it can make more informed decisions on finding optimal store locations. As Katz pointed out, it is understanding the customers—who they are, what they like, where they go, and why they buy things—that distinguishes the Shopping Center Group’s business. And that is enhanced by knowing how these customers move through the trade area. “For the first time, instead of [only] understanding where consumers live, we’re able to see how they move and what that movement does for a trade area and what that movement does for a location decision,” said Katz. For more information on how the Shopping Center Group uses GIS, watch Katz’s presentation to the 2016 Esri Business Summit.